It could be said that Charles Leclerc is already a star but we wanted to take the opportunity to put the spotlight on the 21-year-old and help you get to know our Future Star Of The Week. Charles collected exploits from an early age in karting. French Champion in 2009, then the winner of the Monaco Kart Cup in 2010, the CIK-FIA Academy Trophy and the Junior World Cup in 2011, he continued to shine among the world elite of the discipline until 2013. His rapid rise continued in single-seater from 2014 onwards. Top rookie in Formula Renault in his first season, then in Formula 3 the following year, he raised the pace further in 2016 by winning the GP3 Series. The week following his victory in the GP3 title race, Charles Leclerc was confirmed to be graduating to the FIA Formula 2 Championship for the 2017 season with Prema Racing, alongside fellow GP3 racer and Ferrari junior Antonio Fuoco. In claiming the F2 championship, Leclerc became the youngest ever champion of the main support series for Formula 1 at 19 years 356 days old, and the first driver since Nico Hülkenberg in 2009 to win the championship in their rookie season (a feat which only Nico Rosberg and Lewis Hamilton have previously accomplished) and is the only driver to claim a championship with the Dallara GP2/11 chassis in their rookie season. Stepping up to F1 in 2018, Leclerc showed flashes of ballistic pace on Saturdays and racing brilliance on Sundays, dragging the Sauber beyond its limits – and earning himself a money-can’t-buy race seat at Ferrari for 2019, stepping into the shoes of the Scuderia’s last world champion, Kimi Raikkonen. While initially only announced for 2019, a few days later, then-Ferrari team principal Maurizio Arrivabene indicated that Leclerc’s contract was going to be four seasons long, running “at least until 2022”. 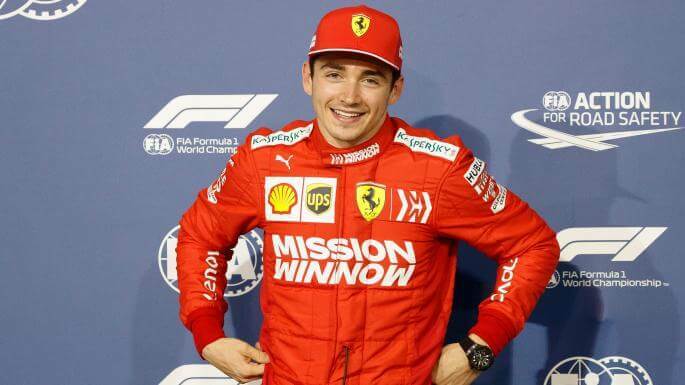 Leclerc made his first test day as an official Ferrari race driver on 28 November 2018 in Abu Dhabi. In his first Grand Prix driving for Ferrari, he started and finish in fifth position at the Australian Grand Prix. In his second qualifying for Ferrari at the Bahrain Grand Prix, he qualified on pole position for the first time in his F1 career having the fastest times in 2 of the 3 practice sessions and in all of the qualifying sessions in the race, setting a new track record and becoming the youngest pilot to score a pole position for Ferrari. He finished third in the race following an engine issue late in the race, having led most of the race before the engine issue occured after the 3/4 way mark. Out of the car, Leclerc is modest and thoughtful – but then he is on his own very personal mission. This exciting young talent is racing for his late father Herve and his friend and mentor Jules Bianchi, the F1 driver who died in 2015. On the evidence so far, he is doing them both proud. Good luck Charles and we hope to see you winning the Drivers Championship very soon!